Jeremy, Dayton, and myself have been trying to coordinate schedules ever since our unsuccessful attempt at Juliet Couloir this spring. 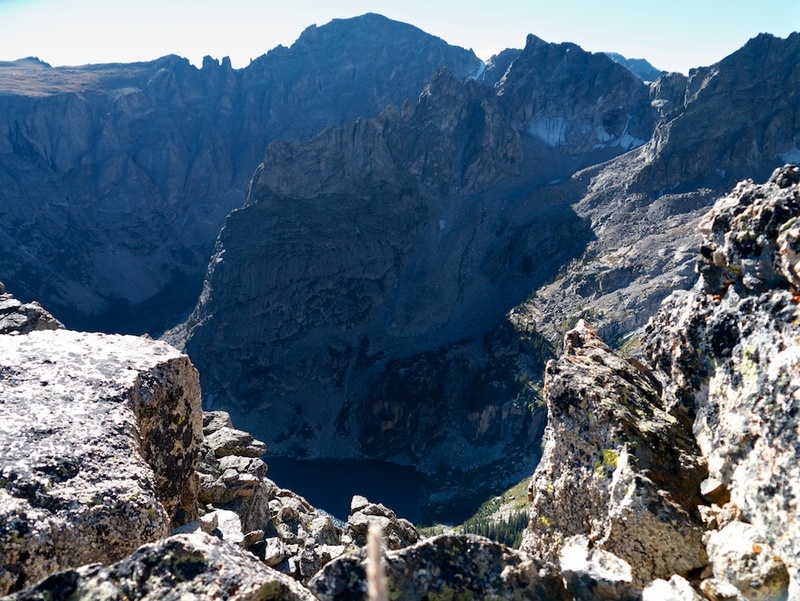 Jeremy proposed this relatively unknown 12er in the Indian Peaks wilderness. 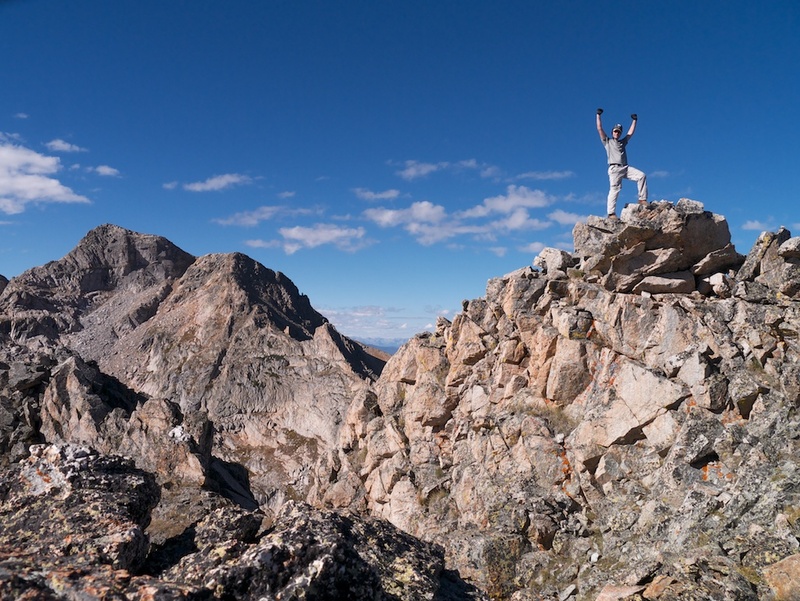 It didn’t take long for Dayton, and I to agree to making Cherokee Peak our objective. Both Gerry Roach and the author of the summit post page, lavish praise on this peak and the Lone Eagle Cirque. This praise is WELL deserved! UN12,130 has no officially recognized name. 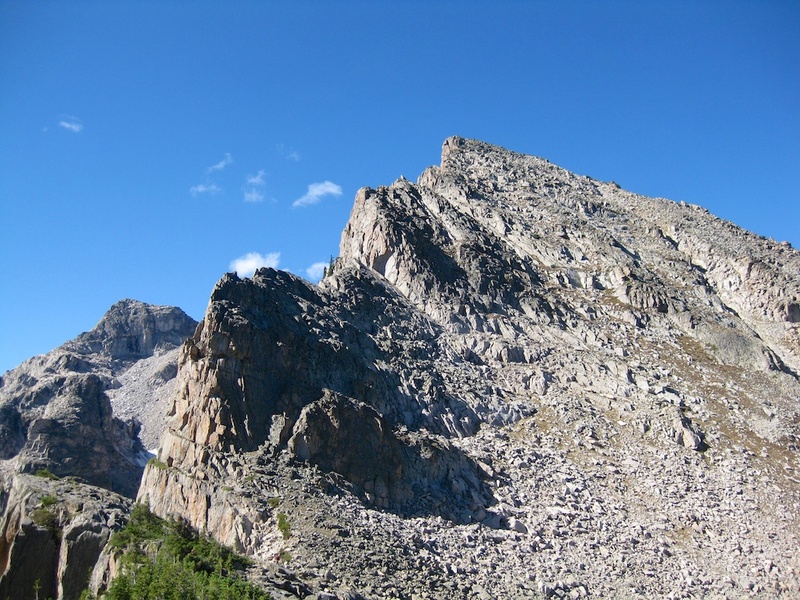 Legendary guidebook author Gerry Roach gave it the moniker “Cherokee Peak”. 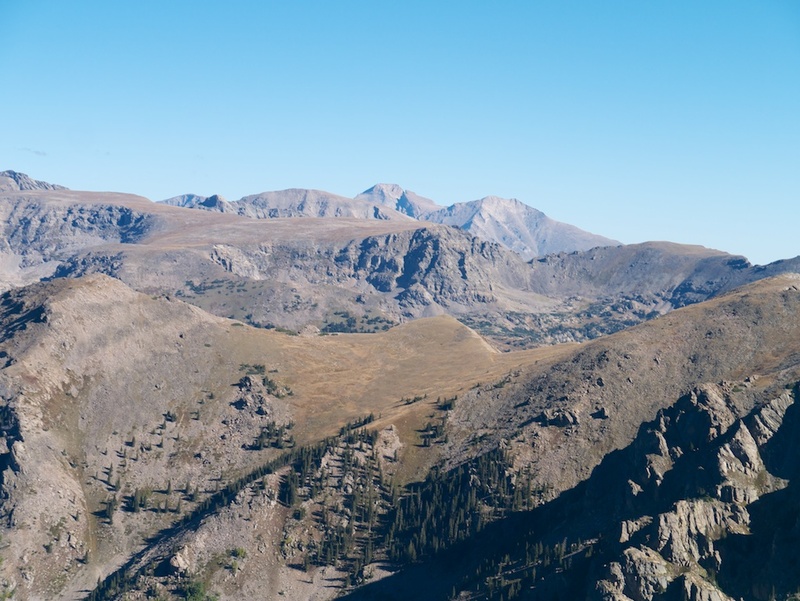 Cherokee Peak sits on the western flank of one of Colorado’s most impressive alpine basins “Lone Eagle Cirque”. 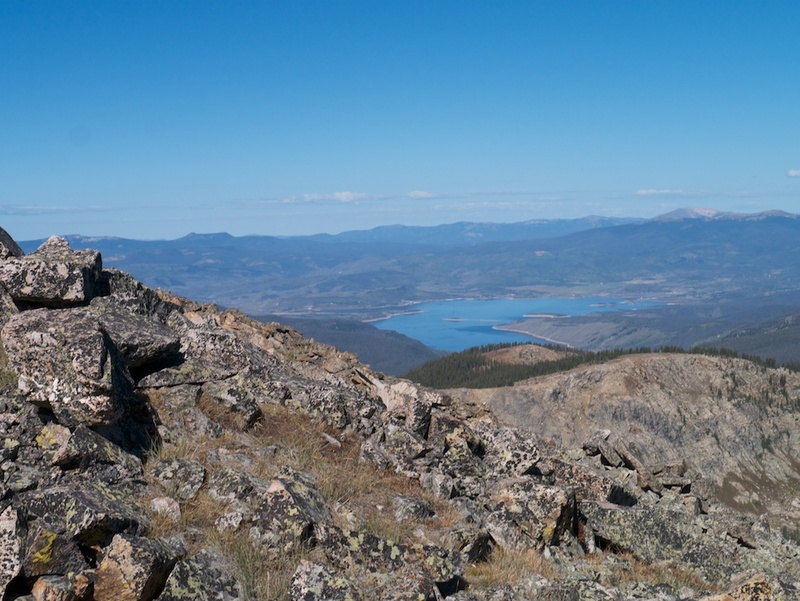 The views of this Cirque from Cherokee Peak, and the lakes below are truly jaw dropping. The namesake peak “Lone Eagle” juts straight up from Crater Lake, and it’s summit is little more than a spire. 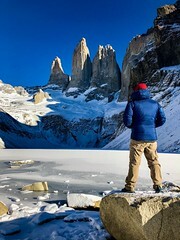 It is a shame that photography and words simply cannot capture the grandeur of a place like this. On top of the beauty, the route up Cherokee is just plain fun!! 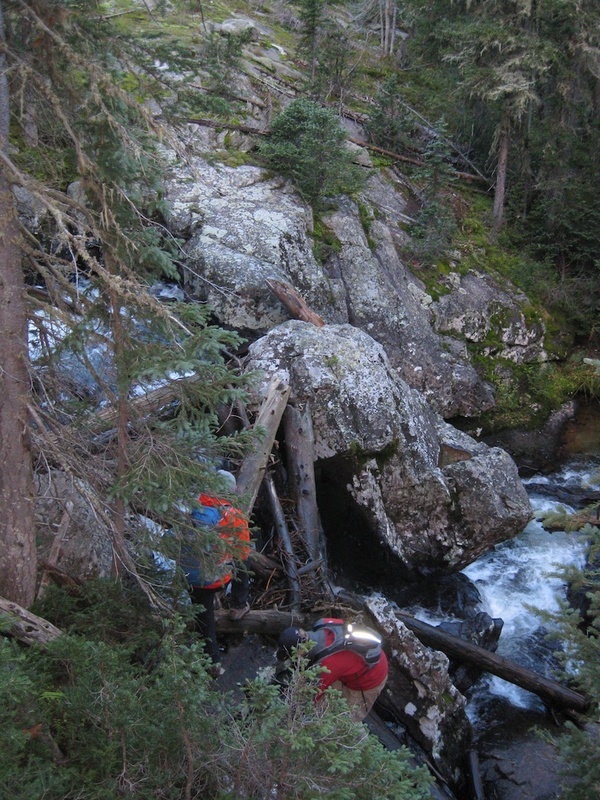 There is a good amount of easy scrambling, some route finding, bush whacking, amazing waterfalls, and a good stretch of easy trail. Jeremy and I decided to spend the night in the back of his truck at the trailhead. Thankfully last week’s record flooding, which closed nearby RMNP, did no noticeable damage to this area, thus our drive up was uneventful. A calm night and crisp fall air led to a good night’s sleep for both of us. This good sleep ended abruptly at 4:30 am as our samsung and iphone alarms competed for attention. Dayton, and his buddy Christian arrived a short time later. We exchanged introductions as we swallowed breakfast. Christian’s breakfast was an egg salad sandwich which could not have sounded less appetizing to my barely awake gut. Knowing we had a very long day ahead of us, we were on the trail by 5AM. There was a noticeable chill in the air, and we all left the trail-head in layers (1 layer for me 7 layers for Christian). The moon was nearly full, and almost directly overhead. The moonlit cascade trail was easy to follow, and headlamps were almost a formality. 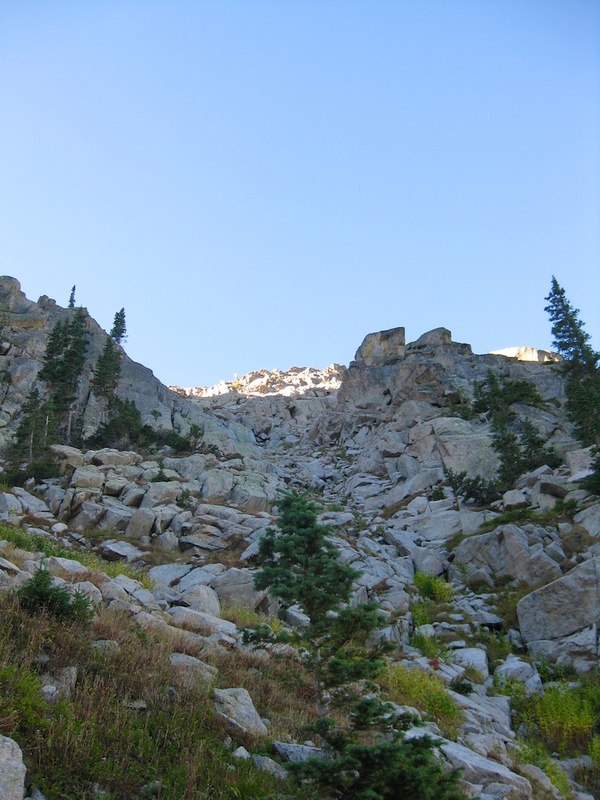 Dayton set a blistering pace and we were soon past monarch lake, and the wilderness boundary. 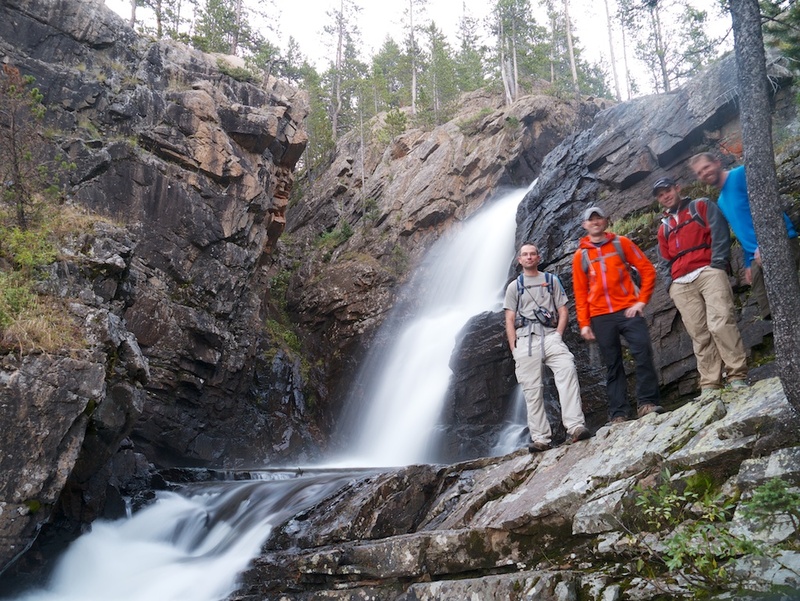 We continued to make good time and reached the waterfalls by sunrise. Here we stopped to take some pictures, and force down some calories. 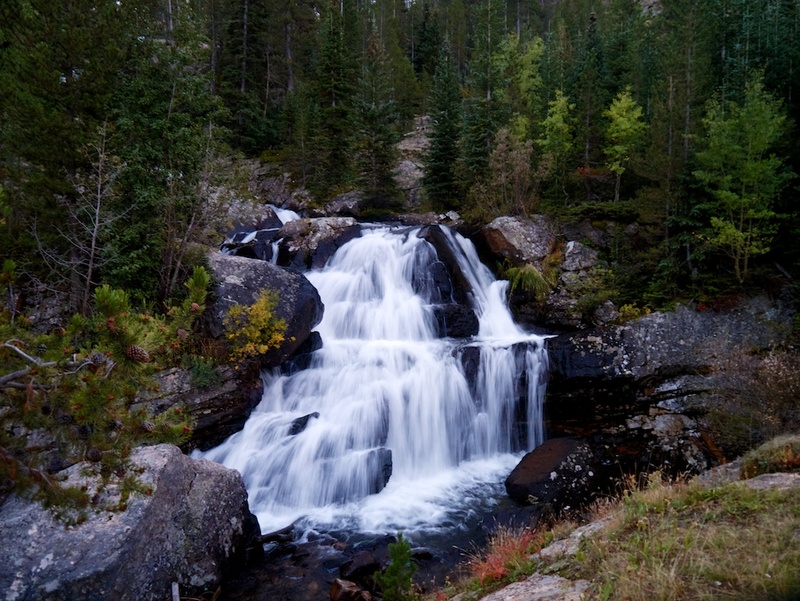 This was one of the best waterfalls I have come across in Colorado. Perhaps a couple of miles later we reached 9,775ft, where we were supposed to leave the trail. We stopped for another quick break to study the route ahead. From here the route to the saddle looks like a loose scree gully. 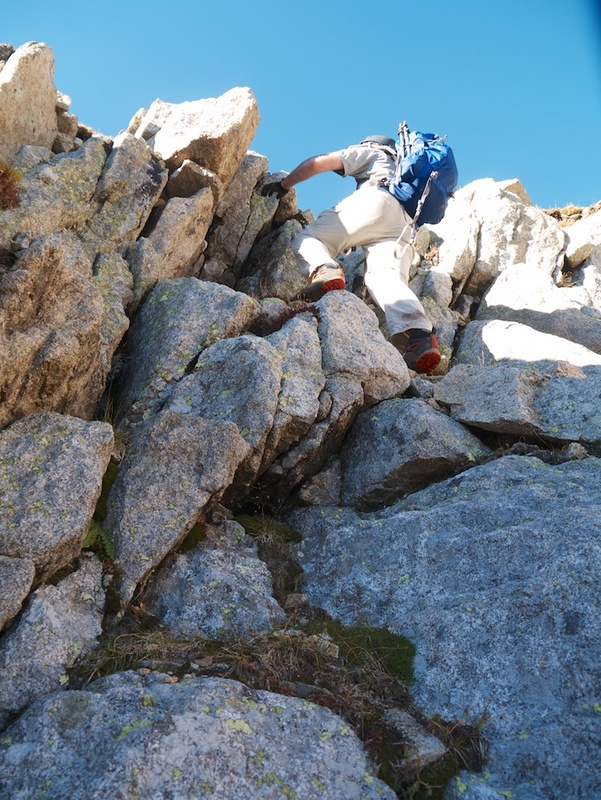 In reality it is steep grass interspersed with short class 3 climbs. Soon after leaving the trail we ran into a troublesome marshy area. This took a few tries to find a dry path through. 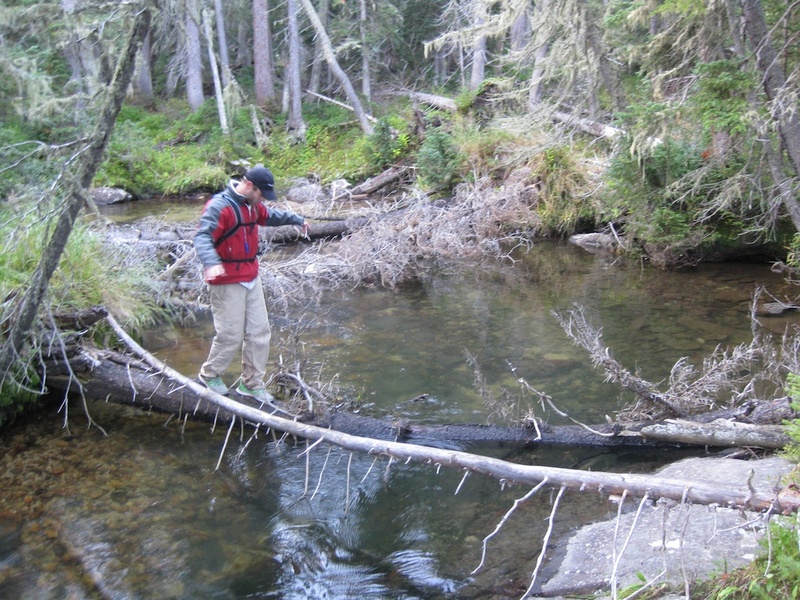 The next obstacle was Cascade creek. Due to all the recent rain it was running high, so we took our time to find a good crossing. Once past the creek the bushwacking is pretty easy. The grade is steep, and moss covered rocks provided some difficulty. However, the forest is pretty open and there isn’t much brush, so we made good time up the drainage. Throughout this section I was sucking wind, just trying to keep pace and follow Daytons orange jacket as he darted up the slope. We spotted what seemed to be a good place to cross the drainage, and begin the real climb. Double checking the elevation against the route description we confirmed this was a good place to cross. Shortly after the creek crossing we reached timberline. We stopped in the last few vestiges of forest to put on our helmets and discuss the best way up to the saddle. Although we were unsure before, from this closer vantage point the obvious gully seemed like the best route. Part way up I stopped to fill my water bottle. There are a lot of opportunities to get water on this route, so I would consider traveling light and filtering water a few times. We had a blast getting up this section. Dayton and Christian put on a “crush clinic” which apparently meant getting up the steep slope at a crazy fast pace. I would recommend not going all the way up to the saddle. Instead when you locate the upper route start to angle your way towards it. See the Route photos section for help in locating the upper route. From just below the saddle it took about 45 minutes to get to the summit. This section had lots of options. You could keep it at difficult class 2, or if desired you could go class 4 with exposure. Our route was mostly class 2 with occasional class 3. We reached the summit at about 9:45AM, and what a summit it was. 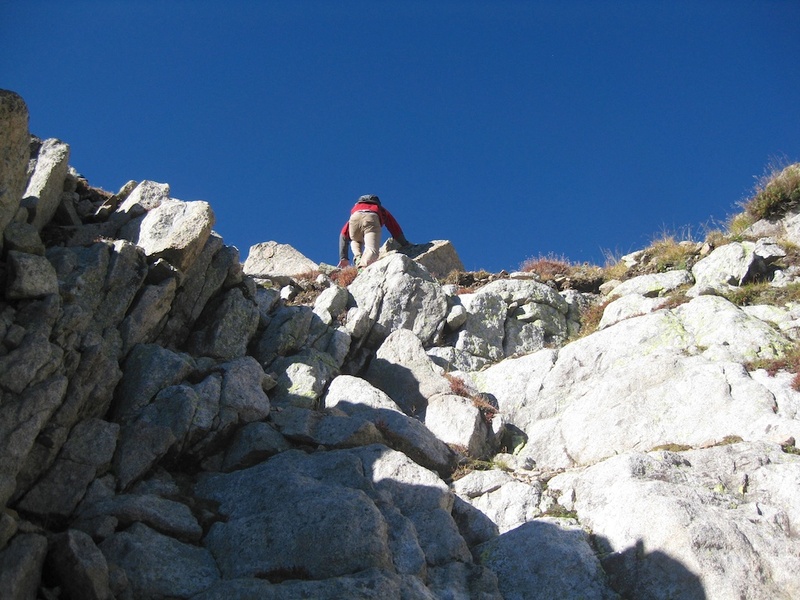 The true summit was a small exposed rock, and every direction you looked the views were astounding. Unfortunately the sun was low and coming directly over the Lone Eagle Cirque. I am going to blame the lighting, and not my poor skill for my failure to get any pictures that captured this vista. 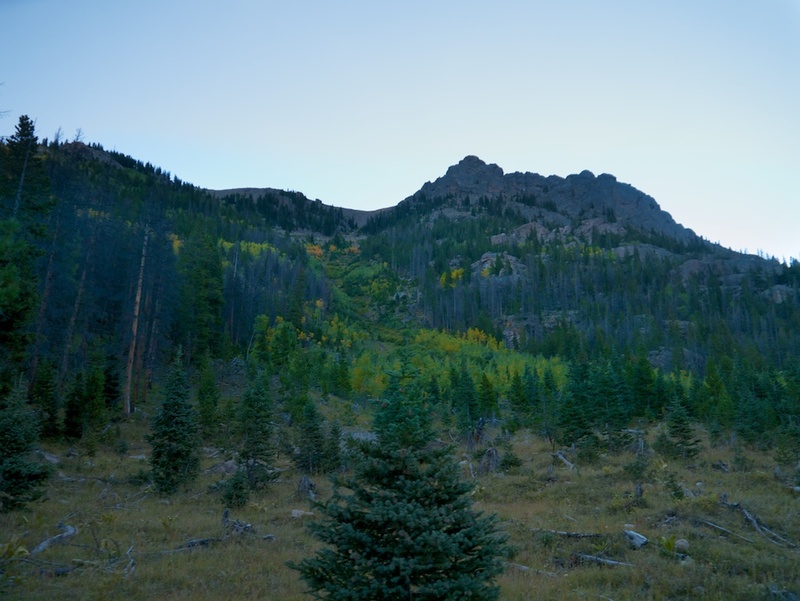 We lounged, ate, laughed, and tried to figure-out the names of the surrounding peaks. 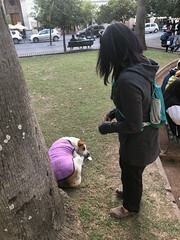 The weather was perfect, and the company was good. Summits like this are why I put myself through all the discomforts of hiking mountains. The descent back to the saddle was pretty quick. The grassy areas can be easy to slip on, so care is required. We also dislodged a couple pretty good sized rocks. One of them ricocheted all the way down with deadly speed!! From the saddle a quick exposed jaunt takes you to pt 11,602. I was rubbing a blister so I elected to sit and soak in some views while the other guys ran over to check this out. The descent from the saddle to the lake was the most unpleasant part of the hike for me. It was almost entirely steep grass, with occasional small down climbs. We did see several pretty fresh signs that there were bears in the area. 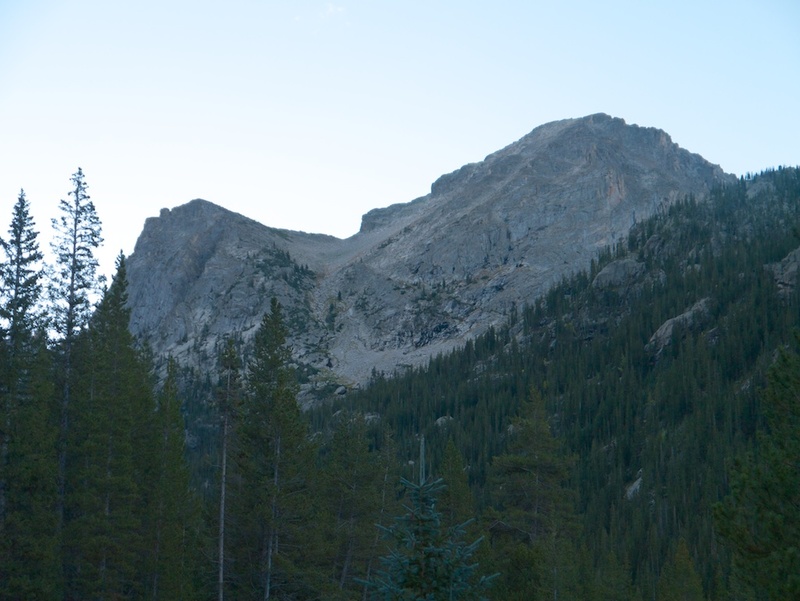 We stopped at both crater and mirror lake to marvel at Lone Eagle Peak and the rest of the cirque. I simply must return to this lake to spend a night an do some more exploring. The return trip from the lake to the parking lot is 7 miles. We had already been hiking hard for 7 hours at this point, and those miles sounded painful. Thankfully the trail was gentle, and we were able to cruise at a good pace. We stopped for one more short break at the waterfalls. 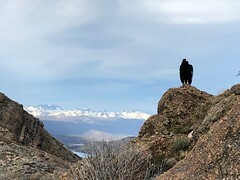 As we got within a few miles of Monarch lake we begin to encounter other hikers. Until this point we had largely been alone in this wonderful wild place. Trail weary, but otherwise in good shape we rolled into the trailhead at 3:15PM. Dayton and Christian hightailed it back to Denver to attend a BBQ. Jeremy and I enjoyed some tasty burgers at Maverick’s Grill in Granby. I had the Mountain Man burger which was a combination of elk, bison, antelope, and wild boar. It was delicious! Overall this was one of the most memorable days, I have had in the mountains. 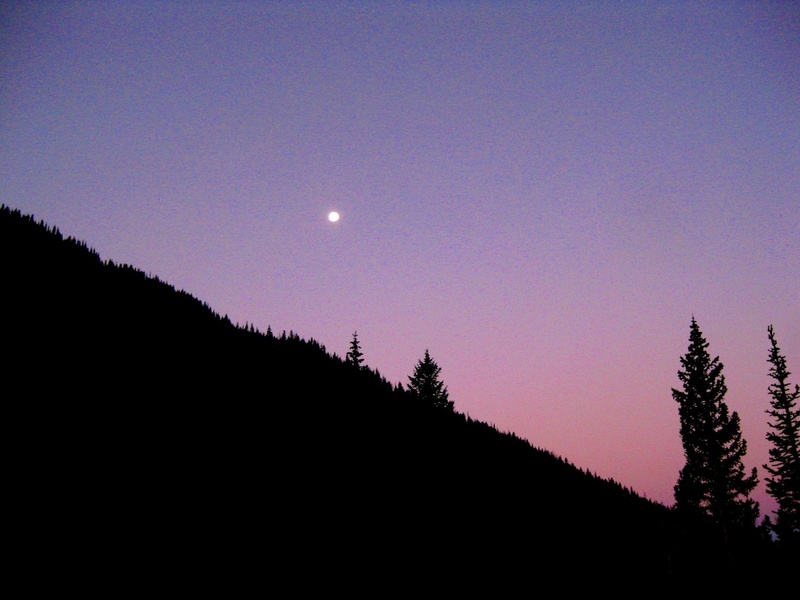 It was a perfect end to a summer filled with great hikes. It is route that should be near the top of your list! 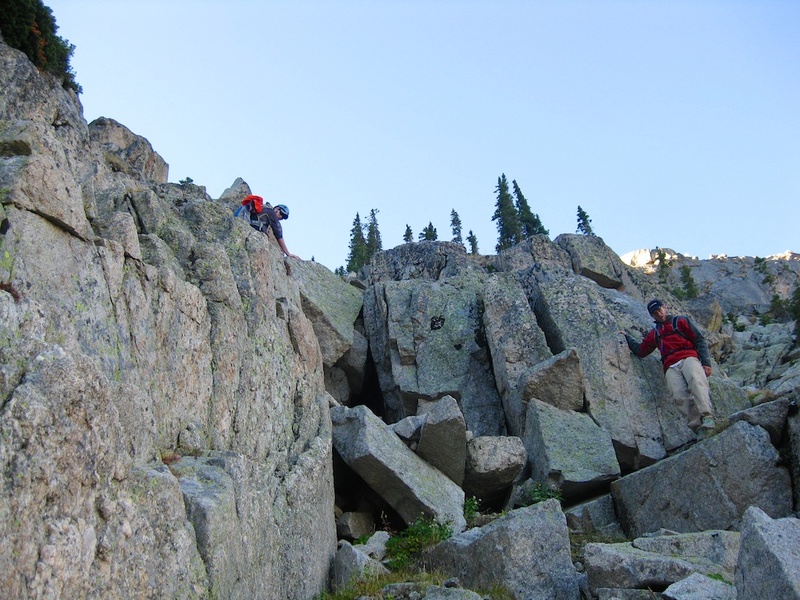 This entry was posted in Mountaineering and tagged Backpacking, climbing, colorado, hiking, mountains. Bookmark the permalink.